Do not connect/disconnect or operate the USB device while driving. Doing so can be a distraction. If distracted you could lose control of your vehicle and cause an accident or serious injury. ● Do not force the USB device into the USB port. Inserting the USB device tilted or up-side-down into the port may damage the port. Make sure that the USB device is connected correctly into the USB port. ● Do not grab the USB port cover (if so equipped) when pulling the USB device out of the port. This could damage the port and the cover. ● Do not leave the USB cable in a place where it can be pulled unintentionally. 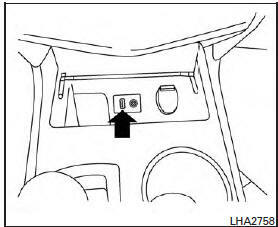 To connect an iPod® to the vehicle so that the iPod® can be controlled with the audio system controls and display screen, use the USB jack located on the center console below the heater and air conditioner controls. Connect the iPod®- specific end of the cable to the iPod® and the USB end of the cable to the USB jack on the vehicle. If your iPod® supports charging via a USB connection, its battery will be charged while connected to the vehicle with the ignition switch in the ACC or ON position. To disconnect the iPod® from the vehicle, remove the USB end of the cable from the USB jack on the vehicle, then remove the cable from the iPod®. * Some features of this iPod® may not be fully functional. Place the ignition switch in the ACC or ON position. Press the AUX button repeatedly to switch to the iPod® mode. 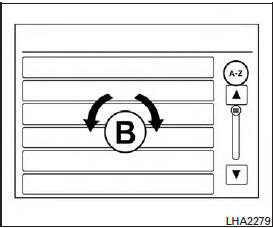 If the system has been turned off while the iPod® was playing, pressing the VOL/ON·OFF control knob will start the iPod®. BACK button or the TUNE/SCROLL knob to navigate the menus on the screen. 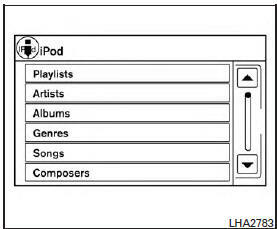 When the iPod® is playing, touch the “Menu” key to bring up the iPod® interface. Depending on the iPod® model, the following items may be available on the menu list screen. For further information about each item, see the iPod® Owner’s Manual. backward or forward one track. for 1.5 seconds while a track is playing to reverse or fast forward the track being played. The track plays at an increased speed while reversing or fast forwarding. When the button is released, the track returns to normal play speed. While navigating long lists of artists, albums or songs in the music menu, it is possible to scroll the list by the first character in the name. To activate character indexing, touch and hold the “A-Z” key in the upper right corner of the screen. Turn the TUNE/SCROLL knob to choose the number or letter to jump to in the list and then press the ENTER button. If no character is selected after two seconds, the display returns to normal.